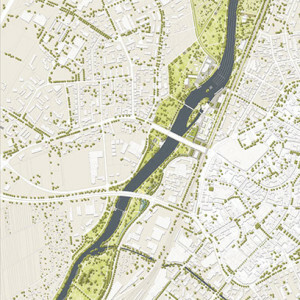 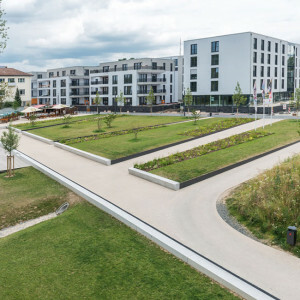 A24 Landschaft Landschaftsarchitektur: The university town of Gießen has recovered the Lahn River, exposing the urban development potential that it had long neglected: the central river banks with their meadows and adjacent urban quarters. 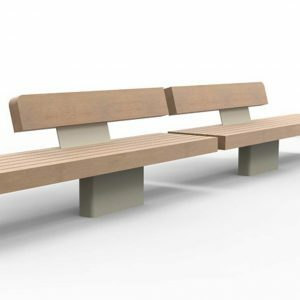 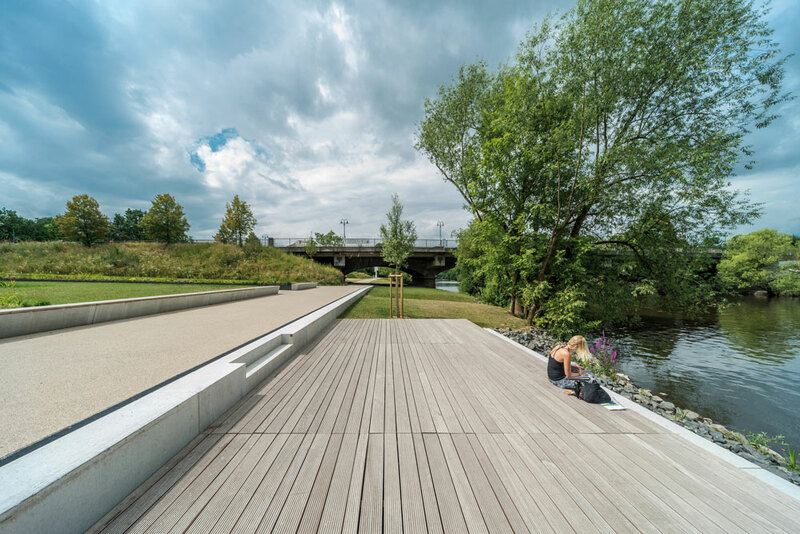 The framework plan will develop the shores of the Lahn into a completely new and multifaceted inner-city recreational area. 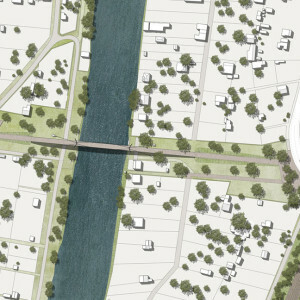 Implementation will proceed in phases, as soon as the various spaces become available. 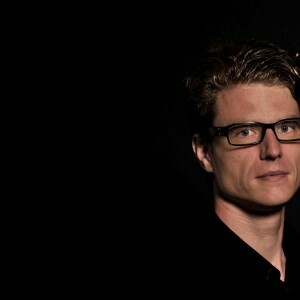 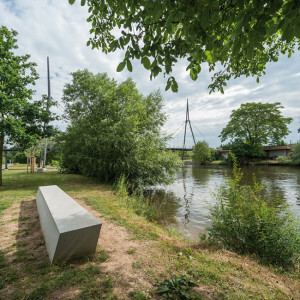 The river has long been thought of and used as a purely functional domain. 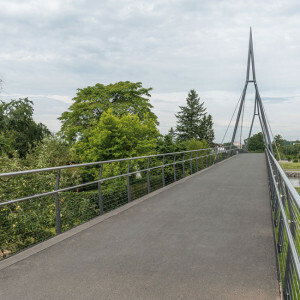 The 1849 construction of the railroad – with its high embankment – alongside the river effectively severed any inner-city access to the Lahn. 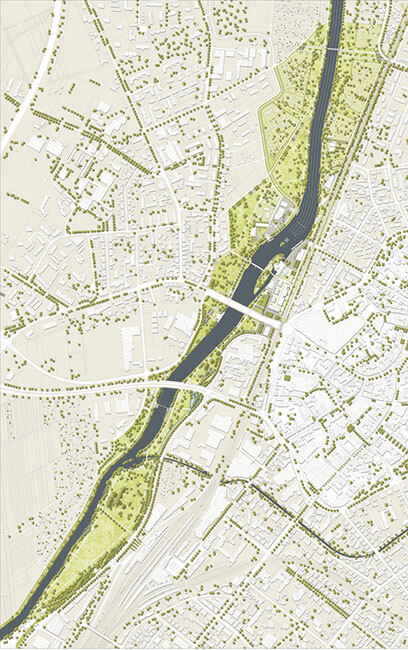 As a result, the river meadows now form an inner-city periphery comprising many inaccessible properties, some of which exhibit large-scale utilization, while others are used only in small fragments or as vast parking areas. 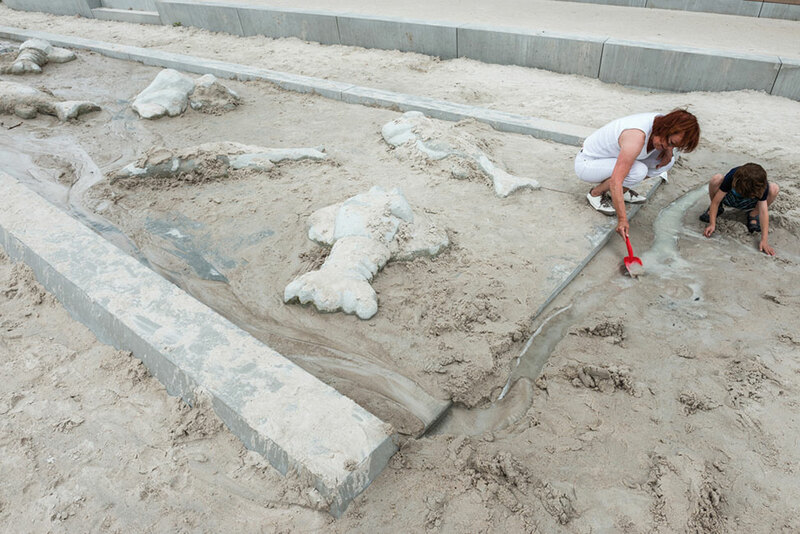 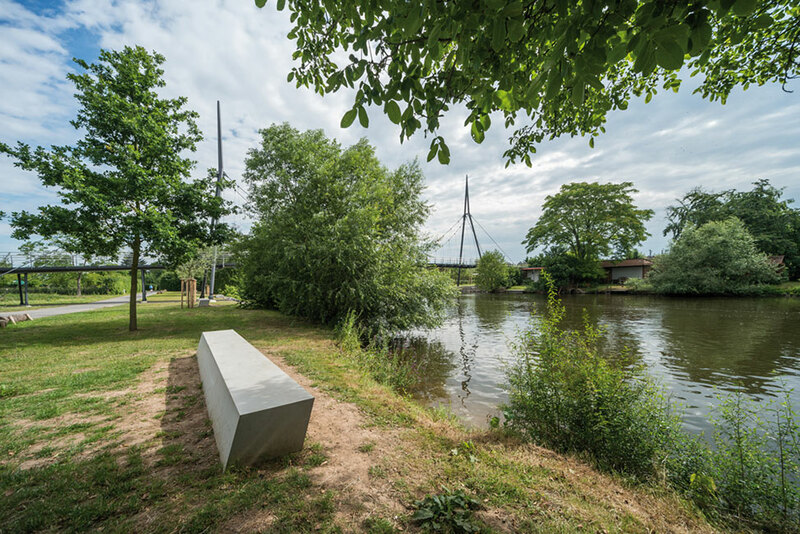 Only with the Europe-wide paradigm of uniting cities with their rivers was Gießen’s potential fully recognized. 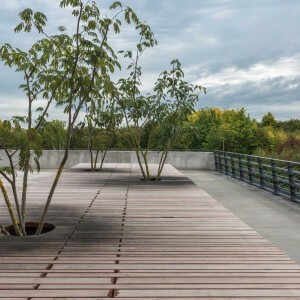 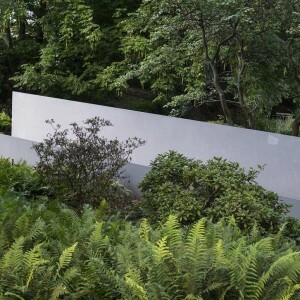 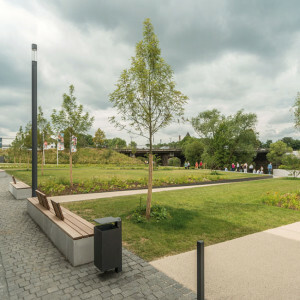 The city of Gießen used the 2014 State Garden Show and the public interest it has aroused to implement the first two measures of the framework plan. 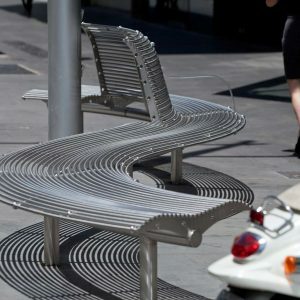 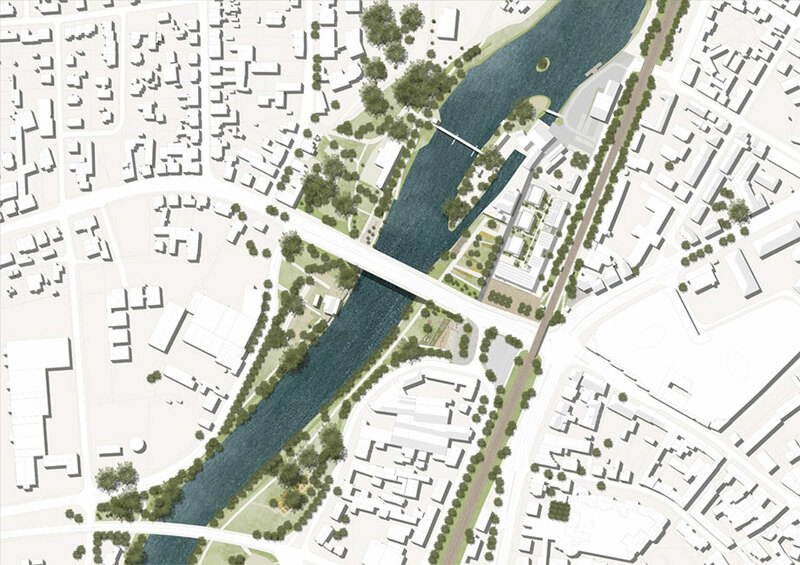 The first project is the newly built entrance to the city in the central urban area of the framework plan. 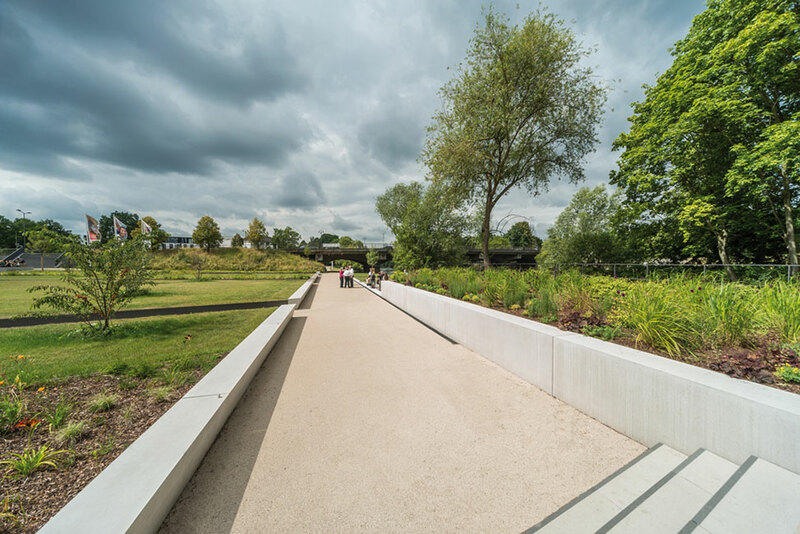 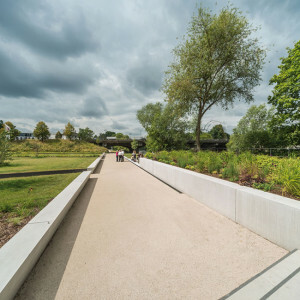 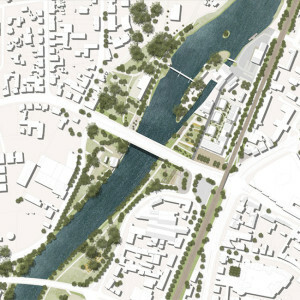 The entrance – “By the Mills” – includes a representative square, a new boulevard, an elaborate mill garden as well as varyingly designed approaches to the water. 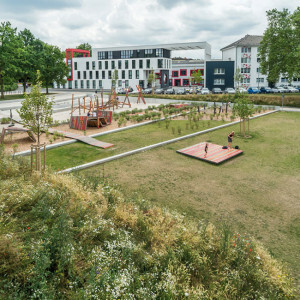 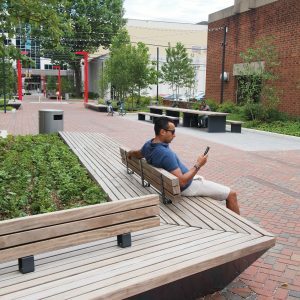 Across from the square lies the large meadow playground, which occupies the site of a former parking lot. 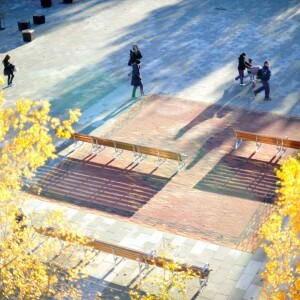 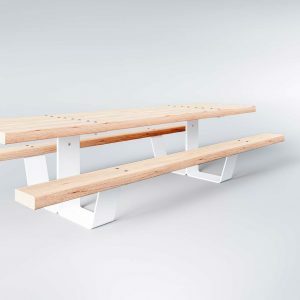 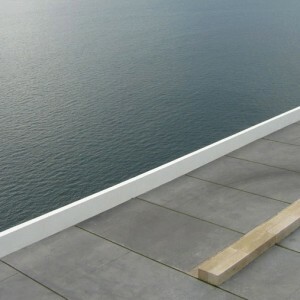 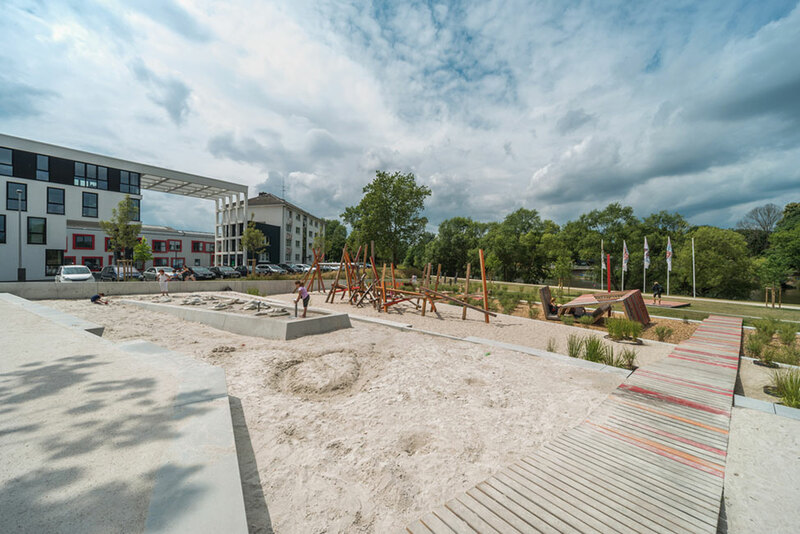 The playground invites children of all ages to play and wreak havoc on four differentiated play terraces. 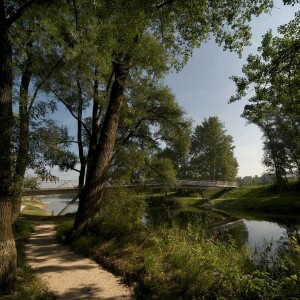 These also reference the river theme, emulating typical elements of a meadow landscape. 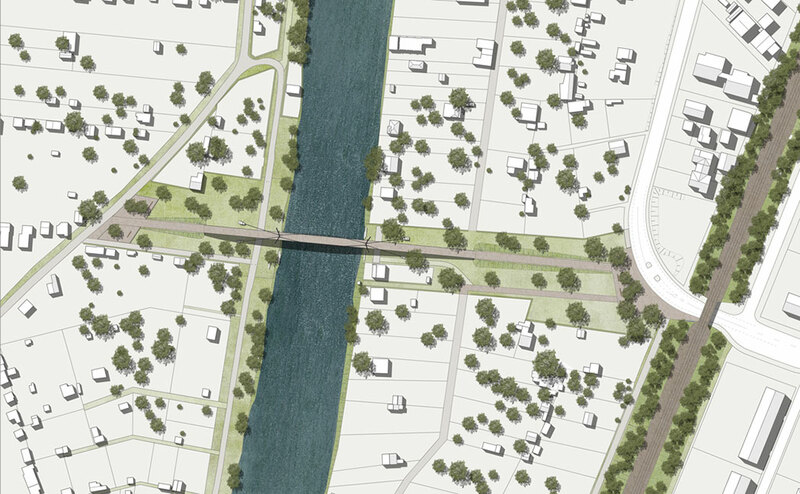 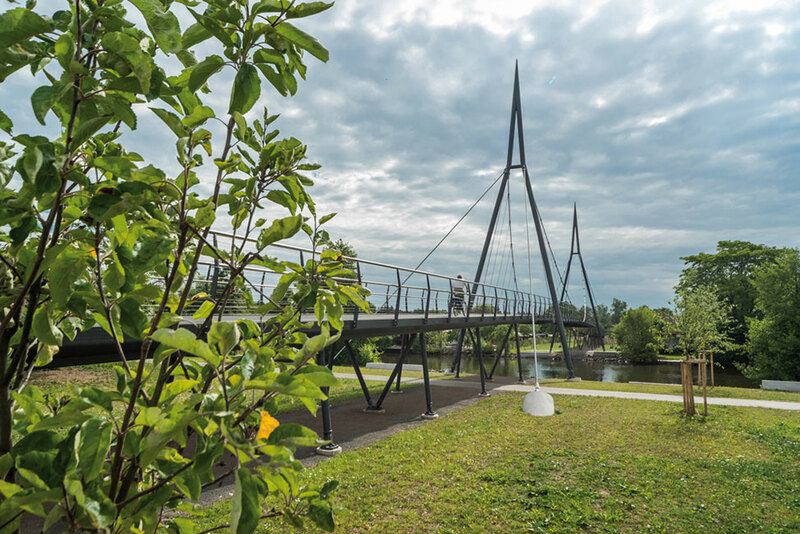 The second realized project is a new pedestrian and bicycle bridge at the northern part of the city. 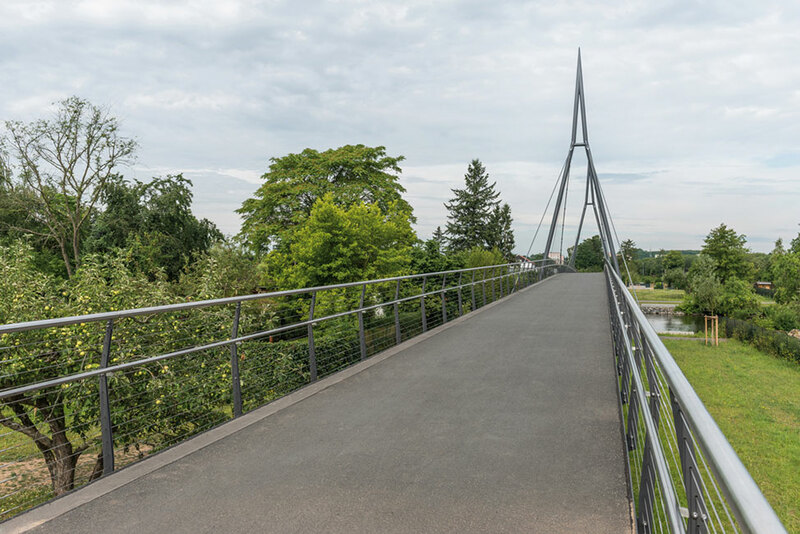 It now constitutes one of three bridges crossing the river in Gießen and has greatly improved the city’s infrastructure. 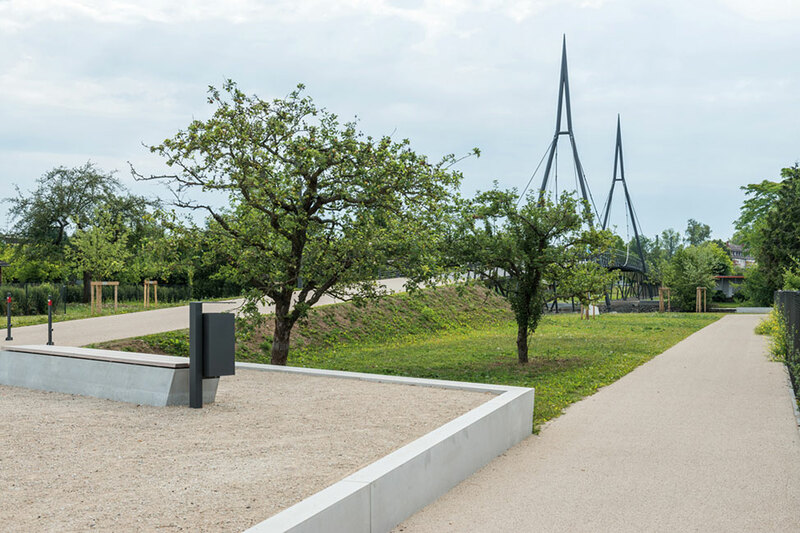 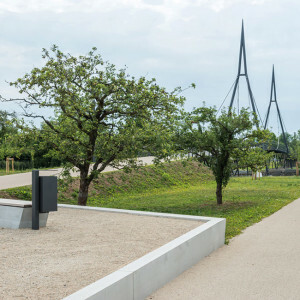 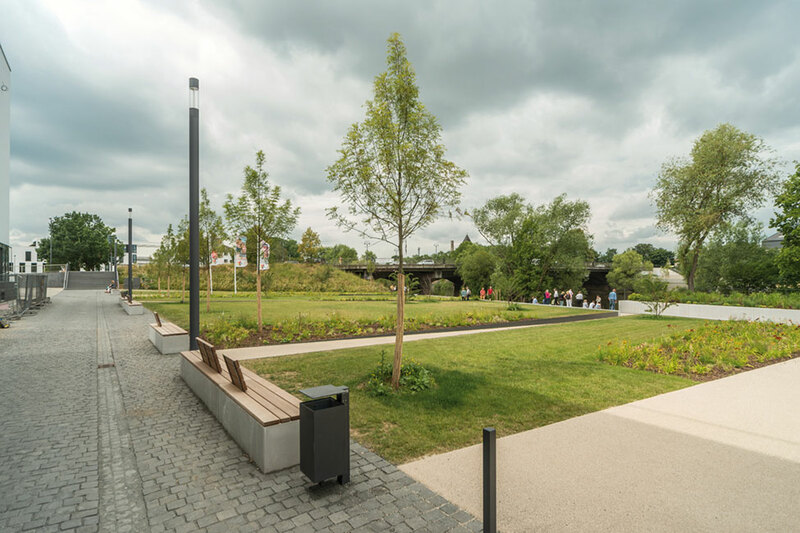 The new public spaces surrounding the bridge make the riverside north of the Lahn accessible. 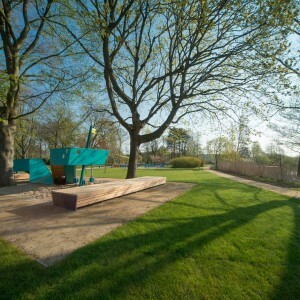 These are the first elements of the extensive grassland park envisioned in the framework plan. 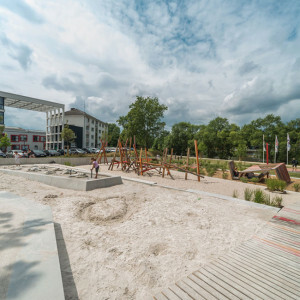 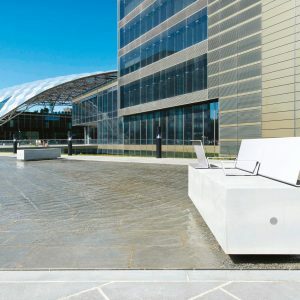 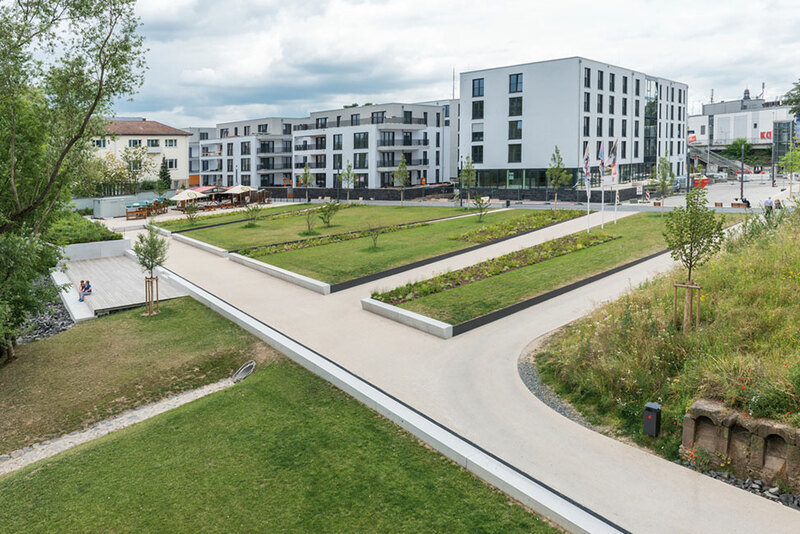 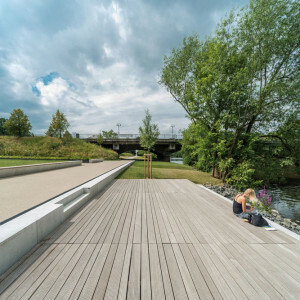 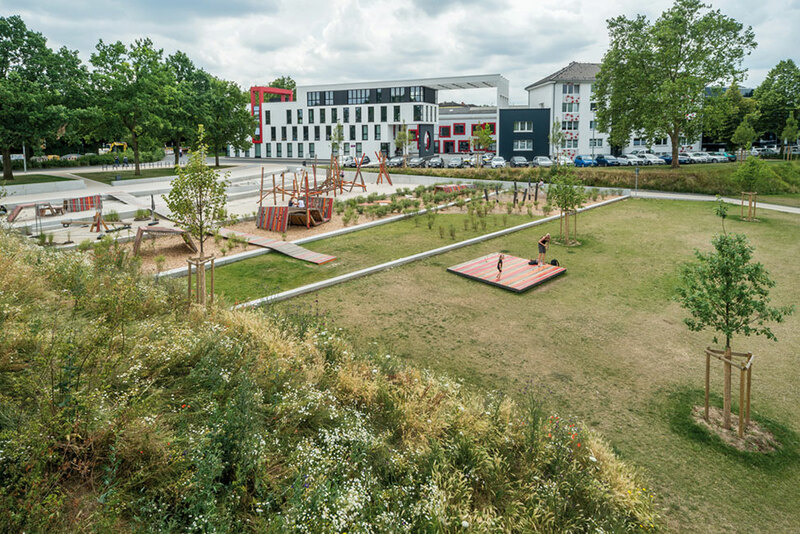 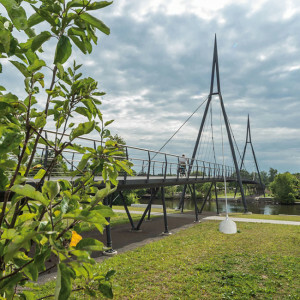 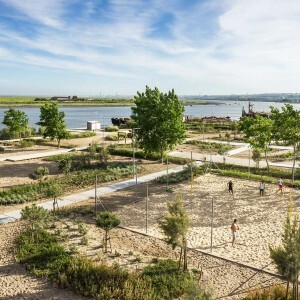 With the gradual implementation of additional goals from the framework plan, the city of Gießen, which had literally turned its back on its river, will gain a new urban-spatial orientation, and along with it, a fully new inner-city recreational area.